lagOmar | What is a Calima? If you have ever been to the Canary Islands during a Calima then you know how uncomfortably hot and dusty it can be, but what is a Calima, and why do we get them?. The word Calima itself originates from the Spanish word for “haze”, in this case the haze is a layer of dust and sand brought on high winds originating from Africa. On occasion weather fronts in the south-west of the Canary Islands can increase wind-speeds even more. In these caesess the Calima can escalate bringing very high temperatures with it, and is able to carry dust 5,000 meters or so above the Atlantic covering hundreds of thousands of square miles with a dense cloud of Saharan sand, amazingly at times even reaching the Carribean. The amount and severity of Calima’s we have here varies, but have always been a part of Canarian life for locals. 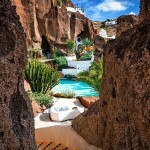 As a foreigner to the Canaries myself I must admit to finding the intense heat of a bad Calima almost too much to deal with when I first moved, however you do become used to it and a few tips picked up form the locals have helped beat the heat. The best tips I have had to date are, firstly and most important drink lots of water, keeping hydrated is the number one. Secondly, keep all your doors, windows, shutters and curtains closed all day. I love to wake up in the morning open the curtains and see beautiful blue skies, but missing a bit of daylight to keep the temperature below 40 degrees in my house is a small price to pay. The other bit of advice was to get in the car, turn up the air-conditioning to max and go see the Island. 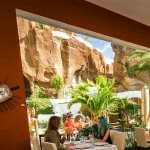 There are so many places here in Lanzarote that you can visit when the mercury is rising and still stay relatively cool, Lagomar being the obvious choice even if I do say so myself. We have lots of shaded areas here to sit back and take a rest from the heat, we also have a covered bar area and wine bar with amazing views out across Lanzarote.